Keyword Management is a holding area for all the keywords in the campaign. 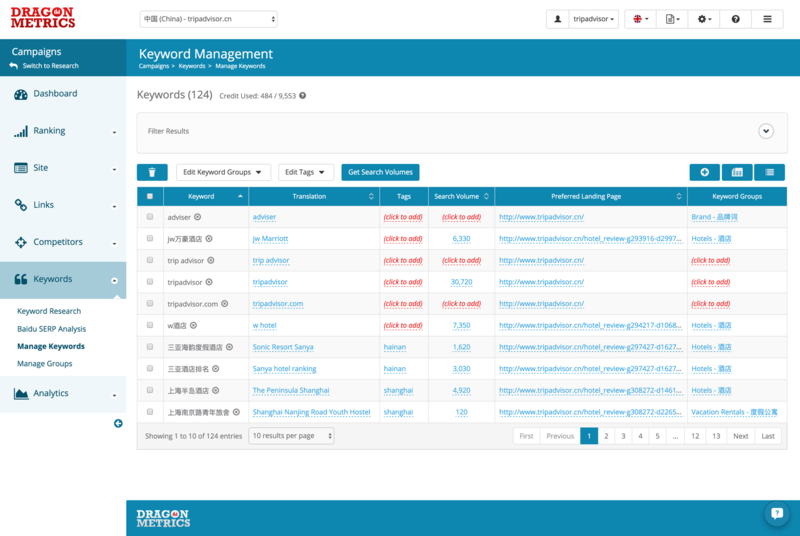 The Keyword Management page makes it easy to add new keywords, update details on existing keywords, or remove them entirely. Keywords added to the Keyword Management area are not be tracked in search engines until they are added to a Keyword Group. Therefore, keywords in Keyword Management do not cost any keyword credits. One use of the Keyword Management area is to add a large number of keywords into it, then choose from these keywords when putting together keyword groups. 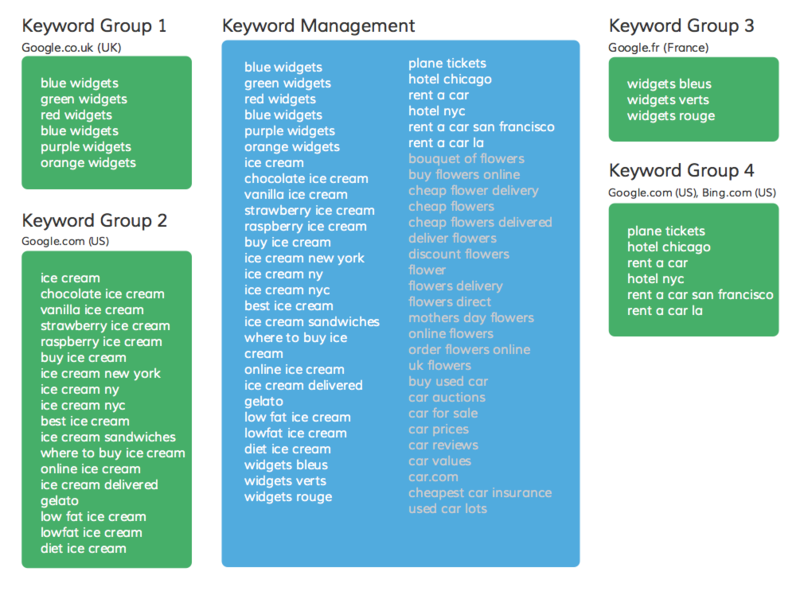 Keywords are automatically added to Keyword Management when added in a Keyword Group. It's also possible to add them directly into Keyword Management (though they will not begin tracking ranking until they are added to a keyword group). Since keywords in Keyword Groups are always linked to Keyword Management. Therefore, making an update to the keyword here will be reflected in all keyword groups it's currently tracking in. 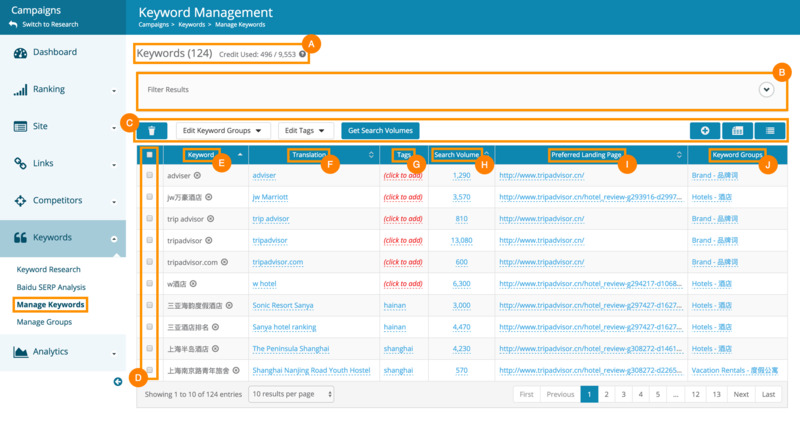 The image below illustrated how Keyword Management in Dragon Metrics works. As demonstrated below, keyword management is a pool of all the keywords inside a campaign, and those are not being assigned to any keyword group (greyed out) will not be tracked, each Keyword Group can have its own set of tracked search engines, and it's a good practice to keep different keyword topics within different keyword groups. I - Preferred Landing Page - Here you can assign Preferred Landing Page for each added keyword, so you can check whether their rankings match with these Preferred Landing Pages. J - Keyword Group - This column shows which Keyword Group's this keyword been assigned to, a same keyword can be assigned to multiple Keyword Group, and if a keyword is not being assigned to any Keyword Group, no rankings for this keyword will be tracked and no Keyword Credit will be consumed.